Warren Mackenzie had a birthday on the 16th of this month. I usually try to remember it and write a post about Warren. Well, I forgot this year again. The small grayish bowl in the center of the picture was made by Warren. We have a couple of these and they are handy little prep. 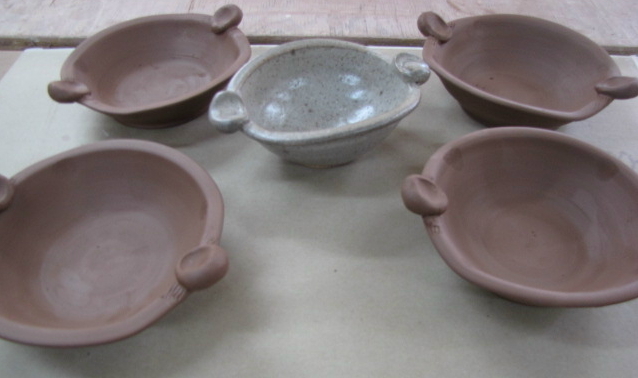 bowls, also good for condiments, or nuts. I think they are funny pots. Just look at those handles stuck on there!! Ha. Great. So I had to make a few to pay homage to my pottery hero. Mine are a bit shallower but I stuck with the odd handles. Happy late birthday Warren (not that you'd ever be found wasting time on the computer). It's the thought that counts.